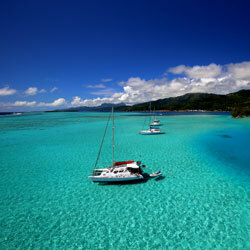 Yacht Charter in French Polynesia on a crewed catamaran. Sail on our luxurious catamaran. 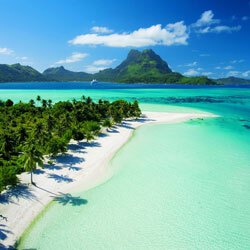 The Polynesia cruise offers a unique cruise coupling the discovery of the islands Tuamotu atolls and the leeward islands. In three weeks, you are doing the rounds of various spots of the most spectacular enjoying Polynesia aboard our luxury catamaran comfort. Our knowledge of these islands provides a unique and immersive cruise deep in Polynesian culture. 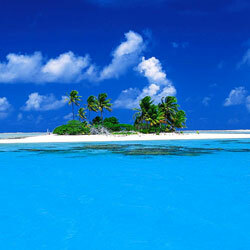 From Rangiroa in the Tuamotu, you discover the wild side and terribly captivating Polynesian atolls with their lagoon surrounded by featureless island, called motu. 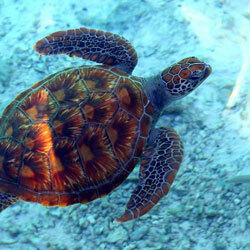 Wildlife and aquatic flora is one of the most consistent in the world, especially in the passes of the atolls. Bottles dives can be added to the program according to your desires. 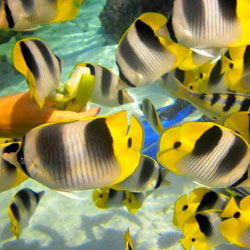 The underwater world is also accessible to non diver remaining surface with mask and snorkel. 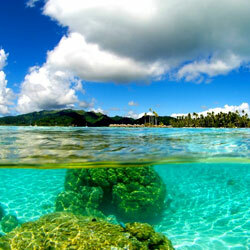 A tikehau, you discover a site of rare perfection in color of the water and the beauty of the motu. Cruising in Polynesia continues to the Society Islands, called high islands because of their vocanique mountain at the center that reach four hundred meters high. Bays and valleys formed by mountains offers moorings unique and majestic decorum. 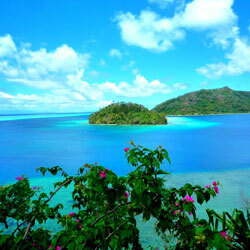 Visiting these islands allows you to understand the Polynesian history. The proposed activities during the cruise offers you the possibility to discover the art and culture of the Polynesian people whose home is one of the warmest. After you welcome at the Rangiroa airport, we offer you a welcome cocktail on board our catamaran. 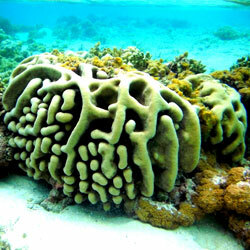 In the afternoon, discovered in snorkeling the coral garden, beautiful diving. 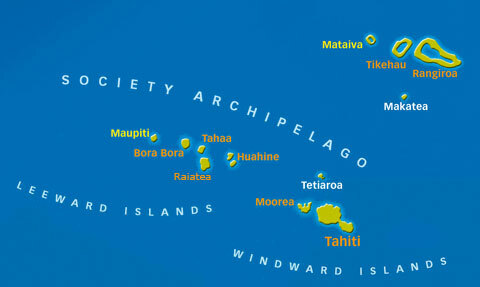 Sail to south of the atoll of Rangiroa Island reefs: the "feo", unique site in the Tuamotu atolls. In the afternoon, visit the feo and ride on the motu desert. Coasting to pink sands of Rangiroa, Snorkeling in beautiful hoa. Kayak ride to the famous sands roses and beach games, relaxing on the beautiful pink beach. Ascent to the Tiputa pass downwind away from wild motu discovery of the lagoon of Rangiroa. 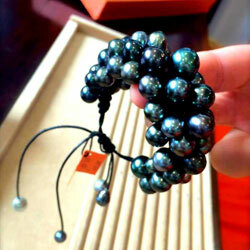 Upon arrival, visit the charming village of Tiputa. 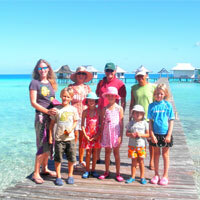 Morning tour of the pearl farm Rangiroa option of a scuba diving in Tiputa pass. Afternoon visit to the beach or village. Morning departure for navigation provides access to Tikehau atoll. 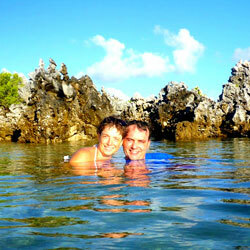 Arrival in the early afternoon, you discover the pass Tikehau and fishing village. 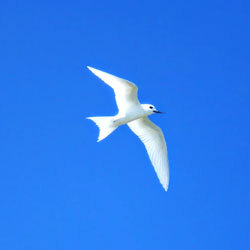 In the morning we sail into the lagoon to reach the motu birds. After lunch, we cabotons to the magnificent motu farm of EDEN. BBQ night on the beach. Favourite moment: the perfection of the motu "Eden farm". Morning tour of the farm EDEN, beautiful working farm on a motu. 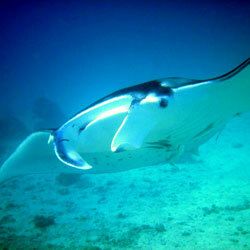 Then navigation to get to the old pearl farm: exceptional spot where you swim with manta rays. Early morning, a second snorkel with manta rays and then we reach the village of Tikehau. You can take the opportunity to discover this beautiful village with many flowers. Favourite moment: The night sailing under the Milky Way with no light disturbance. 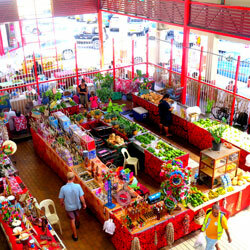 4x4 tour of the island of Tahiti tour or visit the city of Papeete and its famous typical tropical market. Favourite moment: The atmosphere of the Dinghy's Bar at the happy hour! 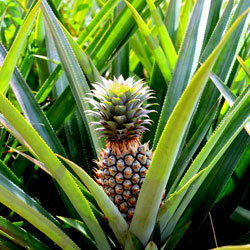 Hike to the lookout, visit the agricol high school and descent through archers through the pineapple fields Rotui. . In the evening departure to Huahine, night navigation . 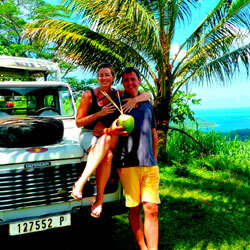 Visit Huahine in 4x4 with a local guide. 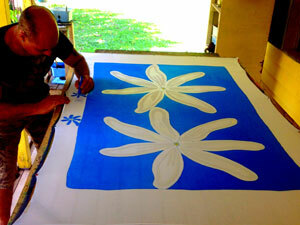 Then small sail to the beautiful beach of Hana Iti where we will a BBQ on the beach at night. We reach Avea Bay south of Huahine where you can practice Polynesian art and explore the Polynesian cuisine in a Maa Tahiti. Morning departure for the neighboring island of Raiatea, crossing sailing downwind under spinnaker, we reach the artificial motu. 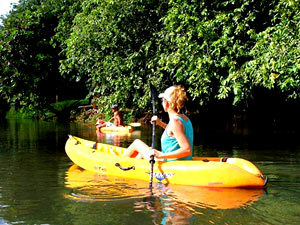 Visit Uturoa and kayak ride and snorkeling with sharks lagoon. Morning departure for the ride of three waterfalls with a local guide. Cabotage in the lagoon to reach Tahaa and snorkeling near the pass. Favourite moment : swimming at the third waterfall. 4x4 excursion with an ethno-botanist to go to the discovery of Tahaa, its vanilla plantations and the interior of the island. 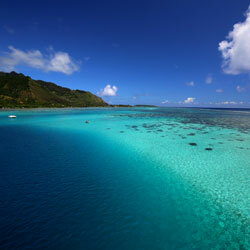 At noon we go to the Coral Garden where you can snorkel drift in this beautiful spot. Morning departure to Bora Bora to sail, anchor western lagoon of Bora Bora. Snorkeling with stingrays and eagle rays (unique!). Navigation in the lagoon of Bora Bora, the most beautiful lagoon in the world. 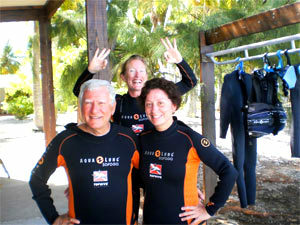 Snorkel with manta rays and then down to the Matira. Favourite moment : the navigation in the eastern part of the Bora Bora lagoon. Snorkeling at the coral garden and Bora Bora cabotage in Bora Bora lagoon to reach the landing place (your hotel or the airport). Who are our cruises for ? 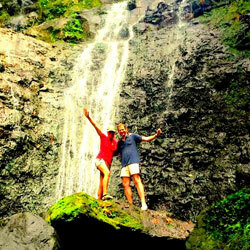 Our cruises meet the demand of couples or groups of friends. 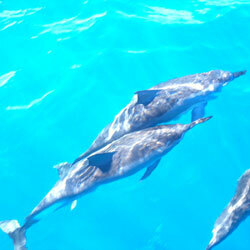 You can also participate in our cruises if you are alone. Our cruises fit your wants and still a success. We welcome families on board by adjusting our prices for the childrens. Everything is provided on board for younger home with appropriate activities and games available. Friends group are welcoming up to 8 adults and more if there's childrens less than 12. The catamaran can be privatised for your group and so activities and journey can be on your decision. 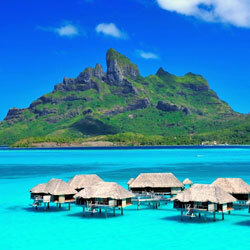 This cruise to the Polynesia is available from € 5,670 per person based on a reservation for 2 adults. 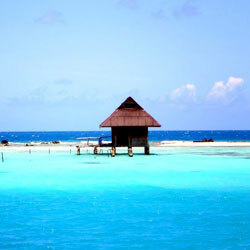 This price does not include meals on land, purchase of personal items, activities that require an outside speaker (scuba diving, guided tour, craft workshop ...), activities requiring rental (bike, car, scooter, jetski, ...).